Wade Rininger, his wife Anna, and their children are leaving the Penn Valley Church in Telford, Pennsylvania, where Wade has been the associate pastor for the Bux-Mont campus, and are moving to Florida. They will be attending the Pinellas Park Grace Brethren Church where Anna’s father, Randy Weekly, is pastor, with the long-term goal of creating a movement of new churches in Florida. Penn Valley Church is a Multi-site Network – One Church in Many Locations, pastored by Tim Boal and Larry Orme. The Telford campus is where it all started for Penn Valley Church. In recent years, they’ve begun planting churches from the inside out starting with the addition of the Bux-Mont Campus in 2008 and continuing with the Quakertown Campus, which began in 2010. 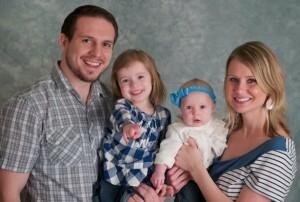 The Riningers will appreciate your prayers for their move, adjustment, and future ministry. God bless you as pursue His calling to Florida. We pray that God will use you to see His kingdom advance.